Warmer weather approaching or already here–either way, these twenty-five DIY ideas will have you wanting to spend every day in your backyard. Enjoy as much time as possible outdoors surrounded by awesome DIY decor and accessories! Get a similar look as you would from a neon sign by using a rope light to make your own illuminated sign, perfect for shining some extra light when you want to enjoy the evening on your patio with your friends and family. Give yourself a place to set your drink while you are relaxing outside by DIYing a timber side table. Roast marshmallows in your backyard over your DIY concrete fire pit, which not only looks stunning but will help to keep you warm on cooler nights. Temporarily add the look of wallpaper to an exterior wall of your home or fence. You can add this leaf stencil using a free stencil template. Color in the stencil design with chalk to add a bold pattern to your backyard until the design washes away on its own. Relax underneath the trees in your backyard by DIYing a hammock with fabric drop cloth and rope. Tight on space? You can make a serving station for drinks and snacks in your backyard. The best part? You can close it when it's not in use. Build a set of two Elm inspired outdoor benches to add seating to either side of your patio table. Replace any worn plastic patio chairs with these sturdy wood benches that are affordable to make. Prevent your patio umbrella from falling over by crafting an umbrella stand out of a large plant pot that's sturdy enough to keep your umbrella standing upright. Fix your stained or bland patio tiles with paint to give your patio a beautiful graphic design. Give yourself some extra space to lay down food trays while you are grilling on the BBQ. You can roll this DIY cart next to the BBQ then roll it right on over to the patio table to save you the trouble of carrying all the food over. Reupholster your old sling chair by replacing the old fabric with leather. You'll have a sophisticated upcycled piece of furniture to use on your patio or even indoors. Keep your kids entertained for hours by building them a tree swing, or indulge in your own childhood nostalgia with this ageless DIY. Fix your stained or lightly rusted patio chairs by giving them a makeover with a fresh coat of paint. This great DIY project will make your chairs look brand new. It's hard to believe but this stunning outdoor bench only costs $35 to make. For a playful decor finish, try building a section of fence or a gate with marbles built into the wood. Give your old IKEA wood bench a makeover with paint. It's the perfect place to rest after working in the garden all day. This weekend make an outdoor succulent wall to add some extra greenery to your backyard. Young children will surely adore having their own playhouse where they can pretend to have a house of their very own in the backyard. Light up your patio with soft flickering candles that are safely protected from the wind pushing them over or blowing them out. A constructed concrete base will sturdily hold the candle in place, while the glass will prevent the candle from unexpectedly blowing out. Freshen up your patio set by painting a bold colorful design onto a large rug. 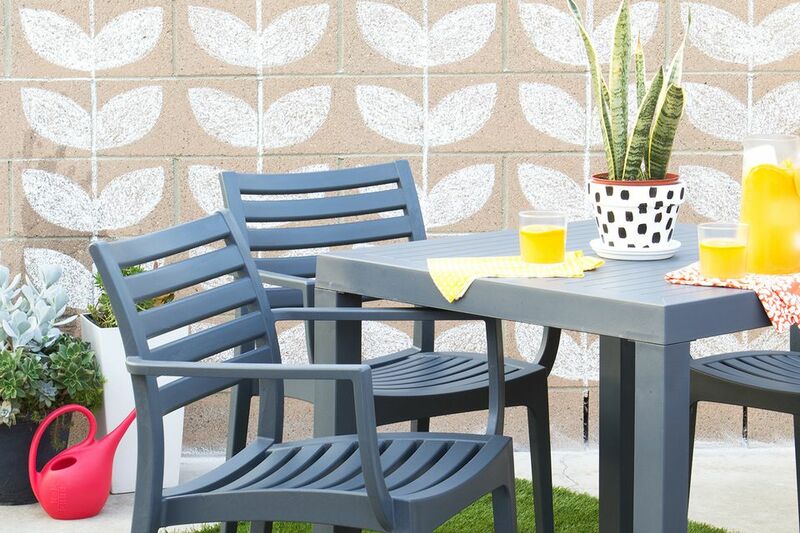 This DIY is a simple way to transform the look of your entire patio. Update your plain patio umbrella with some color by painting on a simple pattern. It will add an extra splash of color to your backyard. Provide your guests with plenty of space to sit in your backyard by building an outdoor sectional that is perfect for large families.